Formerly Shri Ganganath Jha Research Institute situated at Allahabad was taken over by the Rashtriya Sanskrit Sansthan on Ist April, 1971 as its constituent Vidyapeetha named Shri Ganganath Jha Kendriya Sanskrit Vidyapeetha which was later renamed as Shri Ganganath Jha Campus, Allahabad of the Deemed University. This campus is a recognized research centre exclusively devoted to research work on various disciplines Sanskrit Literature. A number of research scholars are registered to carry out research work for the award of Vidyavaridhi (Ph.D.)degree of the Rashtriya Sanskrit Sansthan (Deemed University). 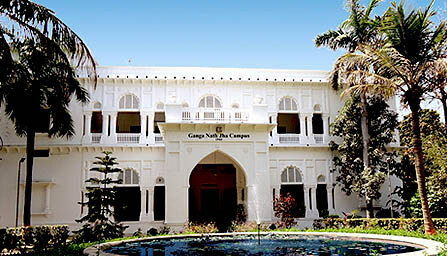 The use of the Library and Manuscripts Section is not only limited to the staff and registered scholars of the campus but also open to all scholars as reference library.It invites scholars and researchers interested in Sanskrit and ancient Indian culture from all walks of life to make use of its library subject to its capacity. All the members of academic staff, besides guiding research work of the enrolled students, pursue their own research work assigned to them by the Sansthan. The research projects of the campus are carried out not only individually but also as team work.